Update 12.35pm PT: It's confirmed: Nike has made real-life Back to the Future: Part II-inspired, self-lacing shoes - and the first pair belongs to Michael J. Fox. Fox, who starred in the 1989 Robert Zemeckis blockbuster and wore Nike sneakers with Power Laces in the film when his character traveled into the 'future' to October 21, 2015, tweeted an image of a letter he received from Nike shoe designer Tinker Hatfield. "Although the project started as science fiction, we're now proud to turn that fiction into fact," Hatfield said in the letter. "As the first, most celebrated wearer of the Nike Air Mag, we wanted you to be the first to receive a living pair." He added that Nike will be making more pairs in 2016, and all proceeds from the sales (or auction) will be given to the Michael J. Fox Foundation, an organization that conducts research into Parkinson's Disease. Nike gave the sales proceeds of its 2011 replica Mag shoes, totaling $9.4 million, to the foundation as well. The Michael J. Fox Foundation Twitter account posted, "This is real. This is today. Coming spring 2016," along with the first image of the Nike Air Mags, worn by Marty McFly himself. Nike left a mysterious tweet last night, tagging Back to the Future star Michael J. 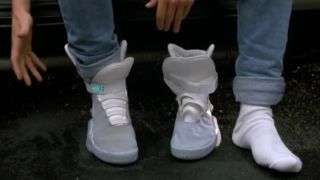 Fox and indicating that we might be seeing something special today - and it could end up being Marty McFly's sneakers with Power Laces. It's a stretch, as Nike's tweet could just be acknowledging Back to the Future Day, saying only, "@realmikefox see you tomorrow." But it hasn't stopped the internet from going a little crazy with the notion that the company could very well be gearing up to announce light-up, self-lacing sneakers to celebrate the day that Doc and Marty McFly go to in the 'future' in Back to the Future: Part II. In fact, some have already begun hearing from sources that new self-lacing Nike shoes inspired by Back to the Future have indeed been spotted in New York stores. Of course, this could end up being just a big marketing stunt, but Nike has previously filed patents for self-lacing tech, one in 2009 and one in 2014. It also released a limited edition Back to the Future replica Nike Mag in 2011, though it was missing the Power Laces. Then there's the fact that earlier this year, according to Kicks on Fire, Nike Mag designer Tinker Hatfield during a trade show said that company was working on Nike Mag shoes with Power Laces for a 2015 release. We'll be getting in touch with Nike to find out more, and we'll also be keeping an eye on Twitter for any further developments. Check out the commercial for the 2011 replica below.